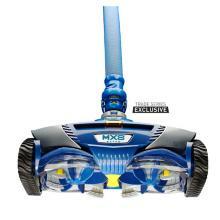 The new MX6 is an highly efficient pool cleaning robot that features best-in-class vacuum power and programmed navigation for a comprehensively clean pool without the hassle. 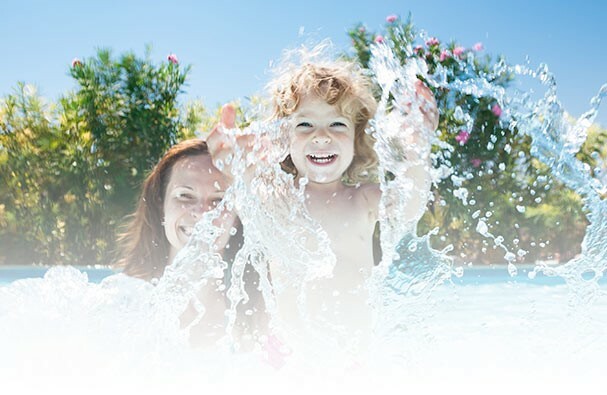 MX6 boasts an innovative low-flow design so it consumes less energy than any cleaner in its class, making it the ideal cleaner for pools with 2-speed or variable-speed pumps. 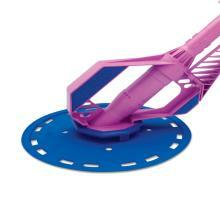 Cyclonic Suction - Provides powerful suction and aggressive wall climbing. X-Drive Navigation - Intelligent bi-directional navigation to thoroughly clean floor, walls, and waterline. Optimized Flow Control - Automatically controls excess flow through cleaner for optimal performance and longevity. Low-Flow Energy Efficient Design - Ultra efficient operation. Best choice for variable-speed and 2-speed pumps and solar. 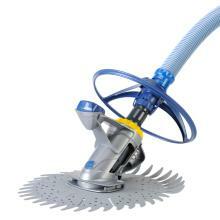 Flex Power Turbine - Articulating turbine blades provide ultra-efficient operation, even on low-flow pumps. Easy-Grip Handle - For easy removal and transport. Quick Connect - Enables quick secure attachment to cleaner head. Twist Locking Hose - Provides simple connection and reduces vacuum loss. A Deeper Clean with Active Scrubbing. The Zodiac MX8 Elite is the first suction pool cleaner with Cyclonic Scrubbing Brushes that continually spin, scrub, and stay in constant contact with pool surfaces to agitate and remove stuck-on debris. The MX8 Elite features aggressive wall climbing to scrub at the tile line and maX-Drive Navigation for better pool coverage with nimble programmed maneuverability. Regardless of surface, the MX8 Elite actively tackles debris and directs it to the inlet using dual-cyclonic technology. With a wide cleaning path and a convertible vacuum inlet to allow for larger debris, this low-flow, energy-efficient suction cleaner delivers a thorough, comprehensive clean that outpaces other premium mechanical suction cleaners. The T5 Duo utilizes the reliable Dura Life™ Diaphragm with one moving part to ensure a long lasting and easy to maintain cleaner. The Dura Life Diaphragm provides maximum durability and silent operation. The Duo Disc System achieves a closer clean with two independent discs for enhanced coverage, greater pool adhesion, and flexibility. The fins allow unimpaired cleaning over lights, main drains, and wall fittings that may hang up other cleaners. Adjust the wheel deflector as needed for fluid navigation around corners, steps, and ladders. The quick connector enables the wheel deflector to attach quickly and securely to the cleaner head. The T5 is for use with Low Flow Pumps, it includes twist lock hose for simple connection, can be used on all pool surfaces, and has 39 feet of twist lock hose (12 sections, 1 meter long). Bonus Cyclonic Leaf Catcher included with T5 Duo. Captures leaves and debris before it reaches the skimmer, pump, or filter to save time and eliminate hassle. Dura Life Diaphragm provides maximum durability with silent operation. Twist-locking Hose secures a simple, easy connection and reduces vacuum loss. Adjustable Wheel Deflector adjusts as needed for fluid navigation around corners, steps and ladders. Quick Connector enables quick, secure attachment to cleaner head. Duo Disc System provides maximum cleaning coverage, and fins allow unimpaired cleaning. 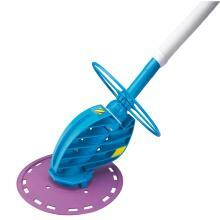 The Zodiac DC33 is a disc-style suction-side pool cleaner that features Zodiac's one moving part technology and unique Dura Life™ Diaphragm for maximum durability and quiet operation. The Ranger is an affordable, dependable automatic pool cleaner that will thoroughly clean your aboveground pool—removing dirt, debris, bugs, twigs, leaves, and even pebbles. Requires no extra plumbing or additional energy cost. 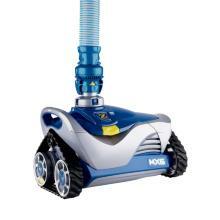 Installs in minutes and comes pre-assembled in the box, just attach the hose and start cleaning. Flowkeeper™ Valve automatically regulates water flow, ensuring peak performance. The Ranger is built to work quickly, effectively, and quietly. Extra Large wheel Deflector - Helps the Ranger from getting caught on steps, ladders or in corners so it can keep on cleaning your pool. Quick Release Cassette and Diaphragm (inside) - The Ranger features one operational moving part. No gears, wheels or flappers means simple operation and maintenance. AG Disc - Allows the Ranger to glide effortlessly along the bottom of your pool, up the sides and around steps, cleaning your whole pool. Quiet Operation - Other cleaners make an annoying flapper or hammer noise. The Ranger was built to work quickly, effectively and quietly. The Zodiac 1500 installs in minutes. Since it’s pre-assembled in the box, just attach the disc and hose. No tools or special plumbing are required. Simply Maintained. The 1500 has only one operational moving part, the Diaphragm. And less parts means less maintenance. If it should ever need service, its Quick Release Cassette lets you remove it and service it yourself, right at home. Flowkeeper™ Valve with Insta-Skim Compact self-adjusting flow control valve automatically regulates water flow, ensuring peak performance. Zodiac 1500 is quiet. Other cleaners make an annoying flapper or hammer noise. The 1500 was designed to work quickly, effectively and quietly. ?Extra Large Wheel Deflector—Helps the Zodiac 1500 navigate around steps, ladders and corners without getting stuck so it can keep on cleaning your pool. Frame—Specifically designed for aboveground pools to provide the optimum balance for perfect adhesion between the Zodiac 1500 and the floor of your pool. 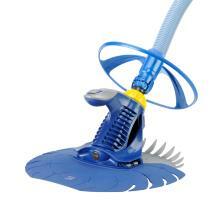 Diaphragm—Efficiently removes debris, bugs, leaves, and dirt from your pool. No gears, wheels or flappers means simple operation and maintenance. Hyper Disc—Allows the Zodiac 1500 to glide effortlessly along the bottom, sides and step areas of your pool.